Weather permitting, all students go outside for 15 minutes of exercise. BoomerTrekker Note: The following article is by Char Koppi about her continued teaching experience at Hangzhou Foreign Languages School. China’s “one child” rule sort of hits you in the face here. I often make references to a brother or sister when I’m giving examples or asking a question. I consistently don’t get a response. So one week I make a point to ask every class, “How many of you have a brother or a sister?” I have a total of 404 students, 11 of them have one sibling. Three of them have two siblings. I am working on avoiding examples using brothers and sisters. The fact that I am from a family of nine is just unfathomable to my students. I am beginning my fifth week of teaching at HFLS. The novelty is wearing off but the experience continues to be enriching. I am learning new things every day about how school works here. There are big differences in how HFLS operates compared to my teaching experience in Minnesota. I arrive at school between 7:15 and 7:30 Tuesday through Friday. Quite often, as I walk from the bus stop to my office building, I see several boys play basketball—sometimes even in the rain. Classes start at 8:00. But often when I arrive I see students wandering the halls, practicing a speech, or working on homework. At 7:40 students have a short mandatory study period. In Minnesota, students travel from classroom to classroom. Teachers generally have a classroom and stay there while the students come to them. Here in Hangzhou, students stay in one classroom all day. Their teachers come to them. On occasion the students will move like when they come to my class one day a week. Even the science teachers bring equipment to the classroom to demonstrate an experiment. The students tell me that on rare occasions they will go to a science lab to participate in an experiment. Eye exercises are part of the daily routine. Students take 10 minutes each morning to massage around their eyes. The students are with the same group all day. In fact, the same group of students stays together from year to year. They are placed in their classes based on their ability. At home we call this tracking and it is generally met with disapproval. Here it seems to work. Some of the students have developed extraordinary proficiency at jumping rope. Their exercise routines are quite entertaining. This week we have had a couple of nice days. 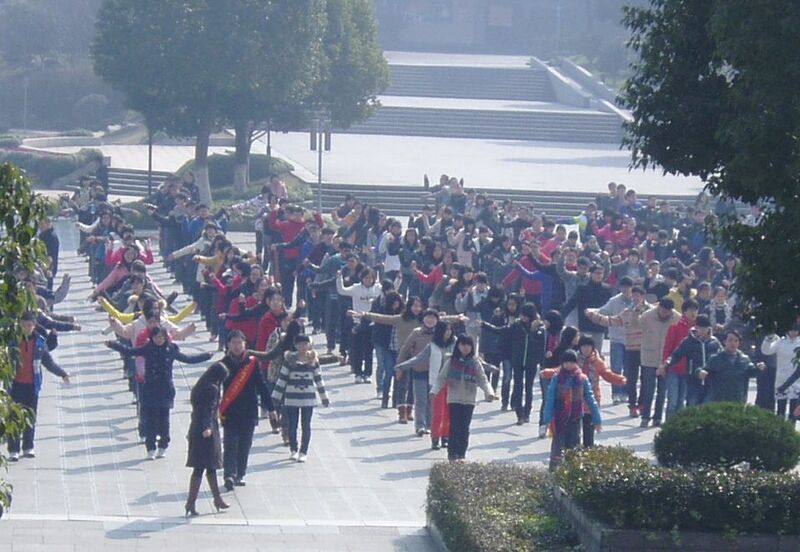 Instead of doing the eye exercises the students run out to the plaza in front of the library. Here they line up with their class and do physical exercise. This is also required by the government. The junior students spend about 15 minutes jumping rope. Two students from each class turn the rope and students run into the rope, jump the rope once and run to the end of the line to take another turn. Sometimes a line of five or six boys will line up and jump the rope as a unit. It is pretty fascinating to watch. The senior students line up and do some sort of stretching and bending exercises. A variety of upbeat music, including The Beer Barrel Polka, blares across the plaza while the students do their exercises. All the students at HFLS are boarding students. Even those who live in Hangzhou are required to live on campus. The kids have a long day. Most are up by 6:15 and have to be in their classroom by 7:40. Monday through Thursday their day ends at 4:30. (On Fridays they are finished at 3:40.) After classes end for the day, the students can either go back to their dorm room or go to a club activity such as basketball and lacrosse. After dinner in the cafeteria the students are required to be in their classroom from 6:15 to 8:40 for quiet study time. There is no time to “hangout” with friends. Some lucky students get to leave campus on the weekends. 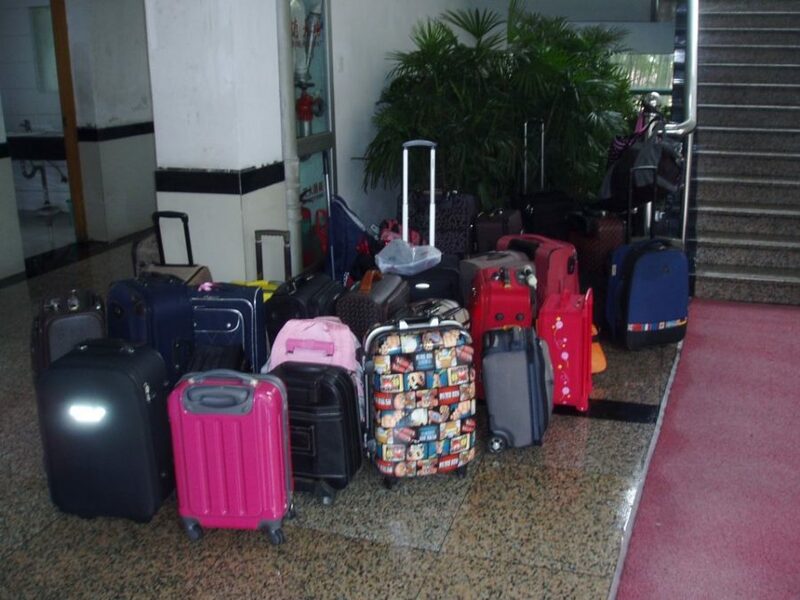 Suitcases are packed awaiting the arrival of parents for the trip home. I leave school at about 2:15 on Fridays. The stairwells are filled with suitcases. Students, whose families live close enough, go home on the weekends. The parking lot I walk across on my way to the bus stop is filled with Mercedes, BMWs, high end Toyotas, and Volkswagens. There is some serious money here! And this final note to the HFLS Update: Friday I was in my classroom waiting for my last class of the day to start. A Chinese teacher, Ms. Lu, came in looking for Amanda, my young teaching colleague from Dallas, Texas. We struck up a conversation as she asked if I was from Minnesota. It turns out that Ms. Lu taught in Minnesota in about 2001-02. “Where did you teach?” I asked. She replied, “I taught in New Ulm.” We both laughed when I told her that is where Joe and I both grew up. She, her husband and her son, who is one of my students, are coming to Minnesota to visit her host families in New Ulm this July. I told her that I would have to make a trip to visit my brothers and sisters there and invite Ms. Lu for coffee. It truly is a small world. Fascinating, Char! I am going to put on some quiet music and try ten minutes of eye massage after I turn off my computer. I don’t think I’ll be able to do it. I love your school up-dates, Char. Details are great! Really enjoying your posts- what an adventure! Missing you two and looking forward to more updates- Hi to Joe! Hi Char, I enjoyed a lot reading your blog. I laughed a lot while reading the part where you used “evil eyes.” It works universally, doesn’t it? By the way, you mentioned “students are placed in their classes based on their ability,” it is not the case actually, they are selected from their peers in elementary school but here in HFLS, students are randomly arranged in different classes rather than being based on their ability. Hi Char. Sounds like you are having quite the experience, good for you!! You will have so many tales to tell, come Ladies’ Weekend! I am enjoying reading your blog. Love the photos, too. I loved reading about your teaching days. Do you know the exact purpose of the eye exercises? I think they would be relaxing, but of course, I haven’t tried them. The structure of the students days might be difficult for many American kids to accept. What do you think? What an experience you are having. Enter your email address to subscribe and receive new articles by email.